In Greek mythology, Orion was both a great hunter, who met Ulysses in the underworld, and also a constellation amongst the stars. His story is described in the Hellenistic myths including Homer’s Iliad and Odyssey. Later Roman legends about Orion also exist, reflecting regional varieties found in local stories. The diversity of myths surrounding Orion have provided a fertile field for speculation about the prehistory of this particular mythological figure. Orion is mentioned in the oldest surviving Greek literature. His legend is first told in full in Hesiod's Astronomy but this text no longer exists. Nevertheless, the Hellenistic writer Eratosthenes has given a fairly long summary of Hesiod's Astronomy, wherein Orion is described as the son of Poseidon and Euryale, daughter of Minos. Orion, in a drunken stupor, attacked Merope, daughter of Oenopion. As punishment, Oenopion blinded Orion and drove him away. However, Hephaestus told Orion that his sight would be restored if he traveled to the uttermost east, where Helios would heal him. Furthermore, Hephaestus asked his servant to guide him to Helios. Eventually, Orion found Helios and was healed of his blindness. He then returned to punish Oenopion but the latter had hid away underground. Orion then went to Crete and hunted with Artemis and Leto; he threatened to kill every beast on Earth. Earth objected, and sent a giant scorpion to kill Orion, which succeeded. Following Orion's death, Zeus then placed Orion (and the Scorpion) in the heavens among the constellations. There are numerous variants of the Orion myth found in the writings of other ancient authors. In the Odyssey, Ulysses sees Orion hunting in the Underworld, slaying animals with a bronze club; but he is also mentioned as a constellation, as the lover of the Goddess Dawn, slain by Artemis; and as the most handsome of the earthborn In the Works and Days of Hesiod, Orion is also a constellation, one of those by whose rising and setting with the sun the year is reckoned. Roman legends, for example, describe Orion as earthborn and of enormous stature but contain different stories about his death. The Latin writer Gaius Julius Hyginus, for example, offers a colorful account of Orion's birth and death. In his version the gods come to visit a poor man called Hyrieus (from Thebes or Chios) who served them a whole bull, and when they offered him a favor, he asked for sons. They took the bull's hide and urinated or ejaculated in it and buried it in the earth—thus explaining why Orion is Earthborn. Hyginus tells two stories of the death of Orion: Because of his "living joined in too great a friendship" with Oenopion he boasted to Artemis and Leto that he could kill anything that came from Earth. Earth objected and created the Scorpion. In another story, Apollo objected to Artemis' love for Orion, and (seeing Orion swimming with just his head visible) challenged his sister to shoot at that mark, and she hit and killed him. Hyginus also connects him with several constellations, not just Scorpio. Orion chased Pleione, mother of the Pleiades, for seven years, until Zeus intervened and raised the whole lot to the stars; the story that he chases the Pleiades themselves goes back to the Works and Days. Canis Minor and Canis Major are his dogs; the first, being in front, is called Procyon; they chase Lepus, the hare; although Hyginus says some critics thought this too base a prey for the noble Orion, and have him pursuing Taurus instead. 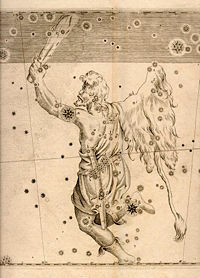 Lucian described a picture with Orion simply walking into the rising sun close by Lemnos, with Cedalion on his shoulder. He recovers his sight there, with Hephaestus still watching in the background. Other mythographers have Orion healed by Aesculapius on Naxos, with no mention of Lemnos at all. As in Homer, Eos, the Dawn, fell in love with Orion, and took him to Delos, but Artemis slew him. Several sources tell different stories of how Artemis killed Orion, either with her arrows, or by producing the Scorpion. She is given various motives: that he boasted of his beast-killing, that he challenged her to a contest (with the discus), or that he assaulted either Artemis herself, or else the Hyperborean maiden Opis in her band of huntresses. The mythographers connect Orion genealogically with other stories. Hyginus makes Hylas's mother Menodice, daughter of Orion. Another mythographer, Liberalis, tells of Menippe and Metioche, daughters of Orion, who had themselves (literally) sacrificed for their country's good, and were transformed into comets. There are several references to Hyrieus as the father of Orion, connecting him to various places in Boeotia, including Hyria; this may well be the original story (although not the first attested), since Hyrieus is presumably the eponym of Hyria. He is also called Oeneus, although he is not the Calydonian Oeneus. There are a number of variant forms of the story of Orion and Oenopion; one source has Merope the wife of Oenopion, not his daughter; another has Merope the daughter of Minos, not Oenopion. Oenopion doesn't want to marry her off to someone like Orion, and eventually Orion, in frustration, breaks into her bedchamber and rapes her; the text implies that Oenopion blinds him on the spot. Latin sources add that Oenopion was the son of Dionysus, and Dionysus sent satyrs to send Orion into a deep sleep so he could be blinded; one tells the same story, but converts Oenopion into Minos of Crete. They add that an oracle told Orion that his sight could be restored by walking eastward, and he found his way by hearing the Cyclops' hammer; and placed a Cyclops as a guide on his shoulder (they do not mention Cabeiri, or Lemnos; but this is presumably the story of Cedalion recast. Both Hephaestus and the Cyclopes were said to make thunderbolts, and they are combined in other sources). In addition to the references above, Orion is used by Horace, who tells his death at the hands of Diana/Artemis and by Ovid, in his Fasti for May 11. Poussin painted a Landscape with Orion, after Lucian's description of the picture of Orion recovering his sight. Karl Kerényi, in Gods of the Greeks, portrays Orion as a giant of Titanic vigor and criminality; born outside his mother like Tityos or Dionysus. He lays great stress on the variant in which Merope was the wife of Oenopion, and sees it as the remnant of a lost form of the myth in which Merope was Orion's mother (converted by later generations to his stepmother, and then to the present forms); Orion's blinding is therefore parallel to that of Aegypius and Oedipus. In Dionysus, Kerényi portrays Orion as a shamanic hunting hero, surviving from Minoan times (hence his association with Crete). Kerényi derives Hyrieus (and Hyria) from a Cretan dialect word hyron, which survives only in ancient dictionaries, meaning "beehive"; from this he makes Orion a representative of the old mead-drinking cultures, overcome by the wine-masters Oenopion and Oeneus. (The Greek for "wine" is oinos.) Fontenrose cites an assertion that Oenopion taught the Chians how to make wine before anybody else knew how. Joseph Fontenrose wrote Orion: The Myth of the Hunter and the Huntress to show Orion as the type or specimen of a variety of grotesque hero, like Cúchulainn; stronger, larger, and more potent than ordinary men, and violent lover of Artemis. Other instances include Actaeon; Leucippus, son of Oenomaus; Cephalus; Teiresias; and Zeus himself, as the lover of Callisto. He also sees Eastern parallels, Aqhat, Attis, Dumuzi, Gilgamesh, Dushyanta, and Prajapati (as pursuer of Ushas). Robert Graves sees Oenopion as his perennial “Year-King,” at the stage where the king pretends to die at the end of his term and appoints a substitute, in this case Orion, who actually dies in his place. His blindness is iconotropy from a picture of Ulysses blinding the Cyclops, mixed with a purely Hellenic solar legend: the Sun-hero is captured and blinded by his enemies at dusk, but escapes and regains his sight at dawn, when all beasts flee him. Graves sees the rest of the myth as a syncretism of diverse stories: Gilgamesh and the Scorpion-Men; Set becoming a scorpion to kill Horus; the story of Aqhat and Yatpan from Ras Shamra; and a conjectural story of how priestesses of Artemis Opis killed a visitor to their island of Ortygia. Orion's birth from the hide he compares to a West African rainmaking charm, and claims that the son of Poseidon should be a rainmaker. ↑ Eratosthenes, Catasterismi (The Loeb Hesiod, 71-73). Whether these works are actually by Hesiod and Eratosthenes themselves is doubtful. ↑ See de Astronomia 2.34; a shorter recension in his Fabulae, 195. Paragraphing according to Ghislane Viré's 1992 Teubner edition. ↑ Zeus and Hermes in the Astronomia; the Fabulae add Poseidon. ↑ The Latin is ambiguous, and both would be represented by the same Greek participle, ourion, thus explaining Orion's name. ↑ Hyginus ascribes this to Callimachus and Aristomachus; Aristomachus of Soli wrote on bee-keeping. OCD: "Bee-keeping". ↑ Joseph Eddy Fontenrose, Orion: The Myth of the Hunter and the Huntress (Berkeley, CA: University of California Press, 1981), 26-27. ↑ Karl Kerenyi, 1951, Gods of the Greeks (London: Thames and Hudson, 1981, ISBN 0500270481). ↑ E. H. Gombrich, “The Subject of Poussin's Orion,” The Burlington Magazine for Connoisseurs 84(491) (Feb. 1944): 37-41. ↑ Kerényi believes the story of Hyrieus to be original, and that the pun on Orion was made for the myth, rather than the other way around. ↑ Robert Graves, The Greek Myths: Complete Edition (New York: Penguin, 1993; original 1955, ISBN 0140171991), 1-5. Gombrich, E. H. “The Subject of Poussin's Orion.” The Burlington Magazine for Connoisseurs 84(491) (Feb. 1944): 37-41. This page was last modified on 4 January 2019, at 16:43.